Furiends! In just under a week my book is going to be launched in America! Although, so far, I’ve never put my paw on American soil, I really feel like I’m living the American Dream! As most of you know I’m French which is why I send you all bisous (kisses) daily. My humans are Cornish and Irish/Australian and we all live on our Irish boat in Italy! We all love the ‘can do’ positive attitude that so many of our American furiends have though. Our very own Nocturne spent lots of her life in a marina in Seattle! The national ethos of the American Dream which encourages freedom and equality is purrfect in my eyes. Even though I’m furry and not American, my American furiends have embraced me and given me an equal opportunity to succeed as a pawthor and I’m truly honoured! I’m super excited for the American book launch and in celebration I’ve got five copies that you can all be in with a chance of winning. There are several ways to enter. You can easily join in by clicking on the rafflecopter below and following the simple steps. Three winners will be selected at random once it closes at 3PM (EDT) on the day of the launch… the 2nd of September. All three winners will then be announced here on my blog in celebration! For those of you who are also creative (I know lots of you are after seeing the ‘Bailey inspired photos’ for the UK launch!) I would love for you to post a photo inspired by ‘the American Dream’ on my Facebook page! It’s completely up to you how you decide to interpret that or what you would like to do. The two photos with the most likes on my Facebook page at midday EDT on the 2nd of September will each win a copy of my book too! Today you can also catch me on buzzfeed here! Good luck to evfurryone, I hope you’re as excited as I am! I loved reading your book and I am entering again hoping to win so I can give a copy to my friend. So happy you liked it Sharon! Good luck! I am very excited your book is coming to America! You are such an inspiration to me and I would love to win a copy! paws crossed for you Chrissy. Thank you for your very kind words. Hehehe! Furiendly banter you know! Purrs to you too. Aha! You spotted a loophole Purrsea! No no on the 2nd of September the day of the launch too! I’ll update that thank you! Good luck buddy! Finally! I can’t wait to see it. Do you have a Kindle version? Yes Charles, which of course allows you to read it but on my mum’s paperwhite for example you don’t really get the full impact of the photos… if you have a fire or an ipad though I’m sure it would look pawesome! I see your point. I have a paperwhite but also a tablet with the Kindle app. I so loo forward to you selling your book in Canada. America and Canada are not the same! Thank you Monty! How exciting! When I asked my publishers about Canada they couldn’t give me a definitive answer on when it would be available. Depending on the bookstore they may have already ordered from the UK or will now, as of the 2nd of September, definitely be able to order from America. I have lots of Canadian furiends too. I hope we can sail there one day. Congratulations. If I win, I’ll review your book on both my personal blog and my Traveling Cats blog. Fingers crossed. Oh wow! That really would be pawesome! Thank you! Paws crossed for you. Paws crossed for you Beth! 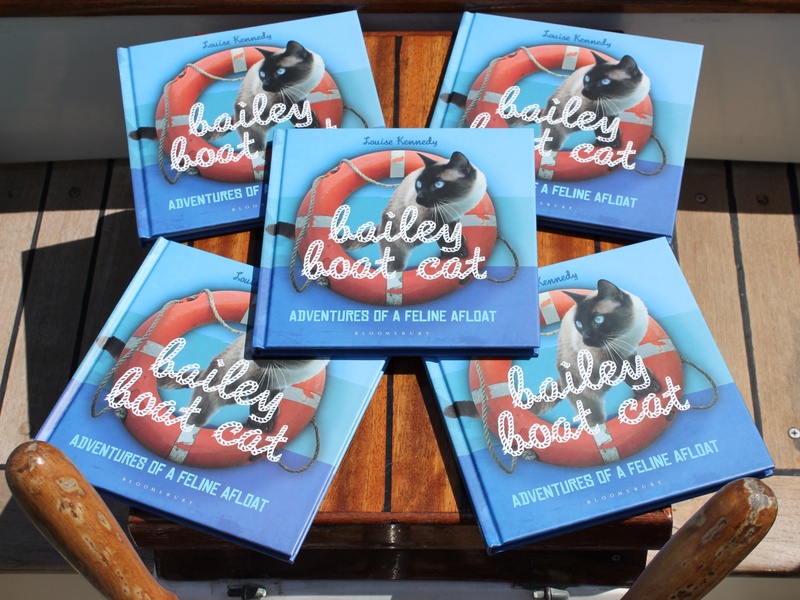 We are SOOOO excited about the American premiere of the book Bailey! It’s such a GREAT book and everyone will just love it like we do! Thank you so much Sammy! Thank you again for your review too, apparently quotes from you are going to be added to my superpage on Bloomsbury’s website which is pretty exciting! Thank you so much dear brofur and sisfurs! You always make me smile and I’m very lucky to have you.It’s so exciting! Those photos were taken today actually! I was keeping an eye on my post photoshoot treats! hehe! How exciting, Bailey! Paws crossed for a great American book launch, and who knows? Maybe you and the Nocturne will come to an American port someday! And if you come to the Marina in our area, maybe my human and I will make the trek out to go visit! Oh Summer I would love that! By then I’m sure you will be a fully trained therapy cat! You could come down to the boat and watch a fishy film with me! Dear Pat, thank you so much. My mum lived in France for four years and I adopted her when I was 10 months old after the human I was living with decided to leave the country and couldn’t take me. Until we moved aboard full-time, mum and I used to commute between our flat in Nice and the boat in Rome- an eight hour car journey! I have a French passport and everything! My furbabies (Oscar and Margarita) can’t wait to get their paws on your book! Pawesome! I’m so excited! I hope they love it! 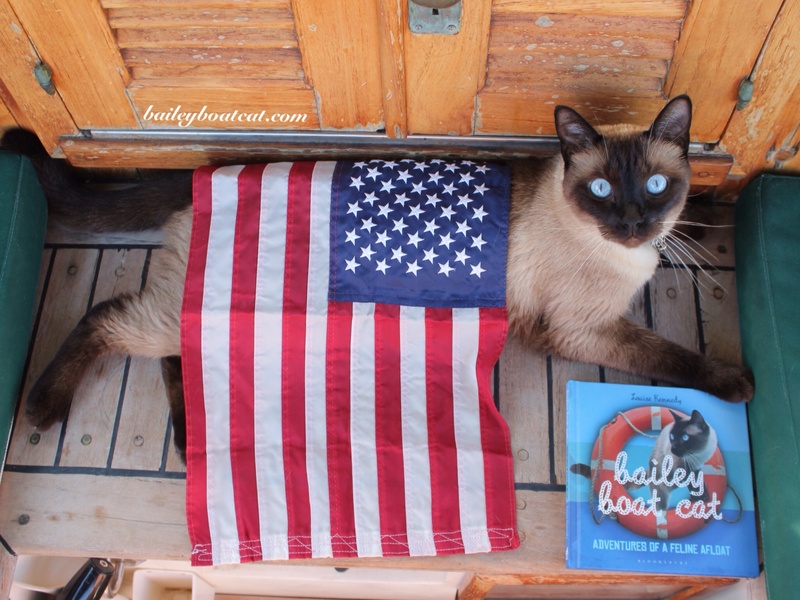 You’re an all American kitty to me, B. Good luck on the USA book release! Aww thank you Cupcake! What a compliment! Pawesome Mitzi! I hope you enjoy it! I have already ordered your book. Good luck to the everyone who put their names in the raffle! Can’t wait for my copy to arrive Bailey!!! Thank you so much Marty. I really hope you like my book. LOVE your movie trailer and can’t wait to read your book. Oh thank you so much. It was fun putting it together. I hope you enjoy my book. If we win your book, we are giving it to our Mom for Christmas because she really, really wants it. That’s so nice of you! Paws crossed for you! My name is Morris. I Was borne in Grenada 3,5 years ago. I live on sailboat called Unicorn. I have sailed thousands of miles together with Anna and Hakan. I would be really fun to write a bokk myself one day. Hi Morris! We’re a very similar age! I love the name of your boat. If love to read a book about your adventures! 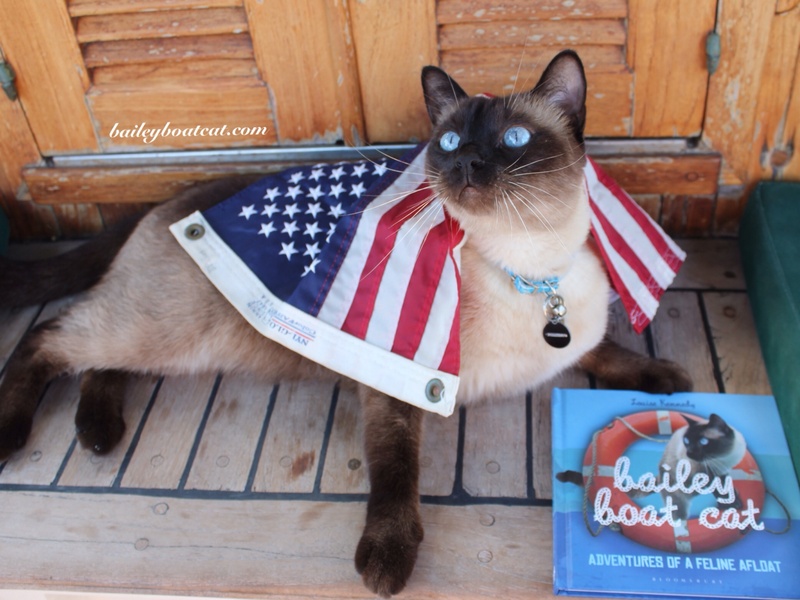 Hi Bailey- We are following your every move and are waiting for your book debut in America. 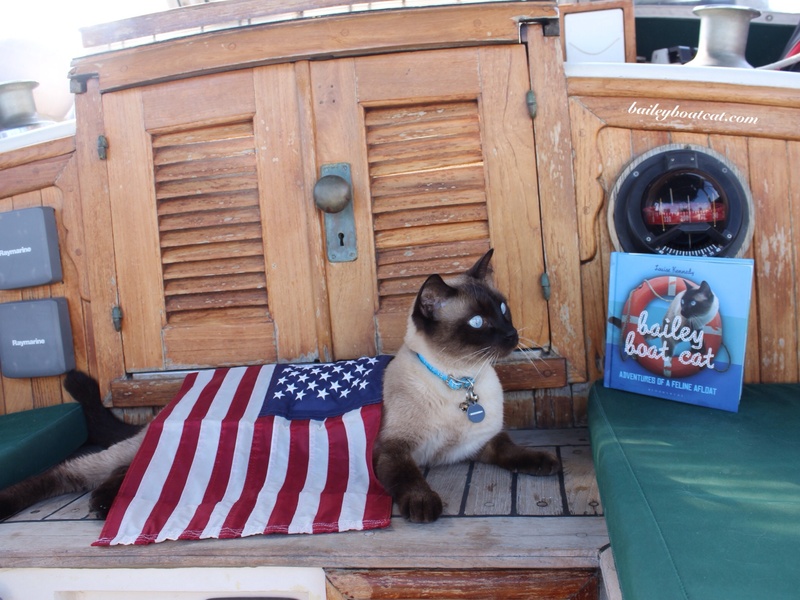 Our cat Alex is also a boat cat on the Chesapeake Bay. Our home port is a place called Deltaville Viginia, a very nice place. Wow! Thank you! I’ve heard lots of pawesome things about Chesapeake bay! Have a purrfect weekend! Yow me bunderfull little Brofur yer da BESTEST!! Yer furamillee iz alot like mine here…. Me iz Siamese (Siam) n Saycred Birman (Burma) n Jewish/Mewish n also haz sum Reggae in me soul…. Mum iz German/Austrian on Paw’z side n Russian n Czech or maybe Poe-lish on Mum’z side n all Jewish/Mewish n adopted Aboriginal too! !